You probably didn’t realize that a place like Silent Hill really does exist. No, it’s not crawling with some of the most terrifying demons from Hell and you probably won’t find Pyramid Head lurking around the town hospital, but it wouldn’t be surprising to find spirits of the damned in the town of Centralia, Pennsylvania because of its eerie and uncomfortable tragic history. Centralia, Pennsylvania started out like any other comfortable small town with over 3,000 friendly inhabitants who genuinely enjoyed each other’s company. It was a town of people who watched out for each other, a safe haven away from the destructions of war and corruption. But since May of 1962, a coal fire has been burning beneath the town, causing most of its residents to find a home elsewhere. Only a few people still remain in the town. The fire company in Centralia used to do a controlled burning of the town’s garbage to get rid of it, especially on holidays like Memorial Day, so people weren’t bothered by the presence of a mountain of garbage. But in May of 1962, the seemingly harmless burning of stinky garbage in a manmade pit to make a holiday smell better gradually and quietly grew out of control. The company noticed the fire in the garbage pit was still burning after days had passed. But it wasn’t until they saw smoke leaking out of the ground that they realized the fire had spread into the old maze of mines below the town. After that, there was nothing they could do to stop the fire. Centralia houses the largest portion of the world’s supply of anthracite coal, and the thing about anthracite coal is that when it starts to burn, it burns very hot and for very long periods of time. So then it makes sense that this fire has been burning for decades underground where no one can reach it to extinguish it. So why is this town referred to as the real Silent Hill? In the original Silent Hill video game, the white stuff falling from the sky was referred to as snow, but in the movies it’s referred to as ash—and in later games like Silent Hill Downpour, there wasn’t even anything falling, just dense fog. Nevertheless, the town is encased in a cloud of white to set the tone for the unstable and horrifying environment. Because Centralia has been plagued by steaming groundwater, smoke and ash for decades from an underground “hell fire,” fans relate it to Silent Hill. The Silent Hill Wikia refers to the Fog World as a dimension trapped between the living and the horrid Otherworld, a place far more terrifying and even more decrepit than the Fog World, a place where we’ve seen Pyramid Head lurking from time to time. The “Fog World” is a broken down version of the living world, usually inhabited by small, hellish creatures and shrouded in the notorious fog. And it is this “Fog World” that so many relate to the Pennsylvania town, for Centralia’s endless puffs of steam and smoke that seem the billow out from haunted caverns beneath the surface. Because of the sudden strange abandonment of the town by its residents, the streets have been left empty and disheveled and many buildings have fallen. This leaves a heavy, melancholy vibe hanging in the air, very much like the abandoned feeling when you’re exploring Silent Hill. According to CentraliaPA.org, there are three cemeteries in Centralia, making the population of the dead much higher than the living. This notion alone leaves people to believe the town is haunted by the spirits who have been disturbed by the fire. The website also describes a highway by the name of Route 61, which had to be closed because fissures in the ground kept cracking open the asphalt and releasing steam. Some might relate this to the strangely torn and cracked roads in Silent Hill that seem to drop off into a bottomless cavern. 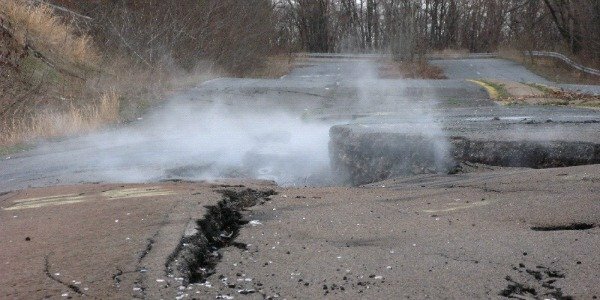 There are many elements of Centralia that relate to the small, haunted town of Silent Hill, so it’s hard for diehard fans to not see a resemblance. Centralia may not be Silent Hill, but it’s probably the closest version of Silent Hill we’ll ever get—and that’s more than okay with me. If you want to learn more about Centralia, there is tons of information on the internet and some great documentaries, like this one on YouTube.